In a small bowl, lightly beat the egg yolks. Melt the chocolate in a heatproof bowl set over a saucepan of hot water, stirring occasionally, until smooth. Remove the bowl from the heat and gradually add the beaten yolks, mixing until smooth. Fold through the cream and stir until combined. Whisk the egg whites with electric beaters until soft peaks form. Add the sugar and whisk briefly. 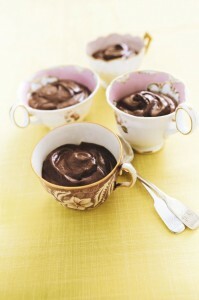 Fold a little of the egg white mixture into the mousse to slacken it, then quickly and lightly fold in the remainder. Continue mixing until there are no streaks or pockets of egg white. Spoon the mixture equally into 6 small cups or glasses, cover with cling film and chill until firm.